Roby Graham’s new book “The Adventures of Fashion Girl” is an exciting romp in the realm of super heroes as the heroine fights all manners of crime in style. Recent release “The Adventures of Fashion Girl” from Page Publishing author Roby Graham is a thrilling set of five stories in which a super heroine modeled for the 21st century and her team of Style Chicks join big name heroes to fight criminal activity, always looking on point while doing it. Roby Graham, a retiree from over fifteen years in the retail industry, has completed his new book “The Adventures of Fashion Girl”: a collection of five engaging tales that feature a stylish super heroine who is following in the footsteps of female role models to protect the innocent, even if it means breaking a fingernail once in a while. Charles Aaron “Roby” Graham began writing these stories as fan fiction. 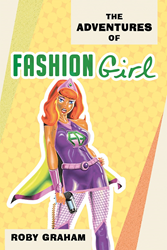 “Originally, the idea I had for Fashion Girl was to be a possible new chapter in the Scooby-Doo franchise. Daphne Blake is sometimes called the fashion plate of Mystery Inc., so I wanted to see how she would do leading a double life as Fashion Girl.” In the end, Graham’s title character took on a persona of her own. Published by New York City-based Page Publishing, Roby Grahams’s epic collection of tales takes place in the fictional city of Colognia, California, where crime has been nearly eradicated by the presence of their devoted heroine Fashion Girl and her tres chic band of Style Chicks. These five stories show Fashion Girl in her best - and best-dressed – form as she teams with other known superheroes to keep crime at bay. Villains have no shortage of evil schemes, but contrary to what her name suggests, Fashion Girl is not afraid to mess up her hair. Readers who wish to experience this exciting work can purchase “The Adventures of Fashion Girl” at bookstores everywhere, or online at the Apple iTunes store, Amazon, Google Play or Barnes and Noble.